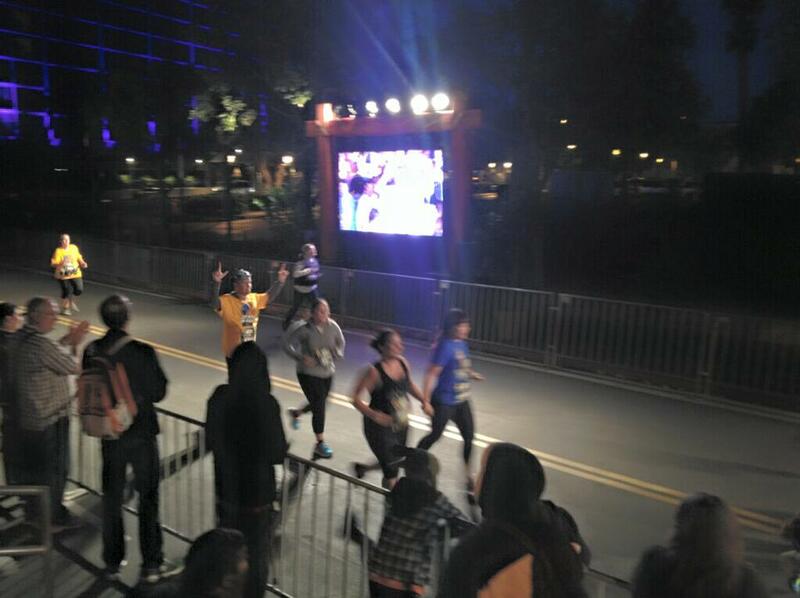 Star Wars Half Marathon Weekend 2015 …. I used the force!!! The concept that nerds are not athletic has been around since the 80s, if not earlier. There was always a mentality of Nerd vs. Jock. Pretty outdated stuff. Nerd culture has gone mainstream, and with that, there are so many different fun activities you can participate in that celebrate the films, books, and games we nerds love. This weekend, I participated in the Star Wars 5k at the Disneyland Resort in Anaheim, California. True to the stereotype, I have never been athletic. The beauty of running, is that it requires no hand-eye coordination. All it requires is a committment to train, and keep putting one foot in front of the other. There no need for actual coordination! There is a race option that suits just about everyone! I started small, with the 5k, untimed fun run. This run had all types of participants from children, to those who chose to walk the entire race, to those who wanted to win it! My fiance who has run several marathons, signed up for the 13.1 mile half marathon. I was in the middle of the pack, someone who wanted to do a combination run/walk, and my goal was to finish the 3.1 miles under 45 minutes, in alignment with my training. I had been running weekly trying to increase my pace and my time using several training programs. RunDisney suggests the Galloway method by Jeff Galloway. The weekend event is huge! There is a race Friday, Saturday and Sunday prior to park hours, and a health/fitness expo in the Disneyland Hotel where you can buy products, and listen to event speakers. I made a few purchases (limited edition Dooney & Burke Star Wars bag), looked at some of the running gear, running clothes, sampled a Clif bar, and picked up my running bib and race info packet. For someone who has never participated in organized sports, this was actually a very emotional moment for me. I found myself nervous and choked up, walking up a ramp reading the words, “A long time ago, in a galaxy far, far away”… This was really happening!!! The next morning at 4am, I awoke to put on my Empire Strikes Back tank top, running pants and shoes. I made sure my running watch was charged and set to my 2/1 Run/Walk. I rolled my hair up in my best Princess Leia buns and headed over to the starting line to meet my friend and experienced marathon runner, Jenn. The vision of people walking through the streets surrounding Disneyland dressed as jedi’s and ewoks was amazing, and I was getting so excited to start! We even saw a couple dressed as the new droids from Episode 7!!! I was in the second group of runners, Corral B, where we waited for the starting announcement. Surrounded by thousands of my fellow Star Wars fans and runners, we were off, while the Star Wars theme echoed from the speakers above us. Not only do you get to run through the Disneyland and California Adventure Parks prior to opening, if you choose to stop along the way at the character photo ops, you can get your picture taken with a variety of Star Wars characters. There were several times throughout the run, I could not believe that I was participating in a running event, something I never thought I would be able to do. I never had a lot of faith in myself when it came to excercise or sports, but there I was, using the force and even elongating my running segments to 5/1 time segments! Jenn and I entered the park in the back through Toontown and passed the Its a Small World ride, we gave numerous hi-fives to Disney employees as we ran through Tomorrowland, we passed the iconic Sleeping Beauty Castle, sprinted down Main St., took a photo op in Radiator Springs in Cars Land, and as we began the final leg through downtown Disney, the race coming to completion, I was full of pride, joy, elation, and anticipation for what race I could sign up for next! I am already planning my costume for the Tinkerbell Half Marathon, and I cannot wait to add to my collection of medals !!! I definitely did not take enough photos but here I am below, crossing the finish line, smile from ear to ear and tears in my eyes! I recommend checking the http://www.RunDisney.com website for further info on upcoming races. I am so thankful for my fiance who has supported me to believe that I can do anything, and my friend Jenn for being the most fun running buddy in the universe. A funny thing happened to me since my last blog post… I became engaged!!!! So fellow nerdalicious folks, I am in love with love, gazing over wedding dresses that remind me of princesses and wondering if it would be too much to exit on a white horse…(that wouldn’t be over the top right?) 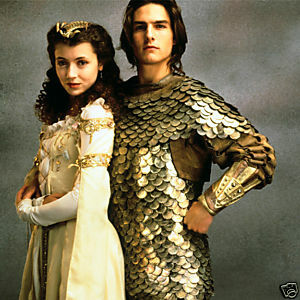 I decided I would dedicate some blog entries to my favorite couples within the worlds of sci fi/ fantasy. This brings me to one of the most romantic films of all time… The Princess Bride. 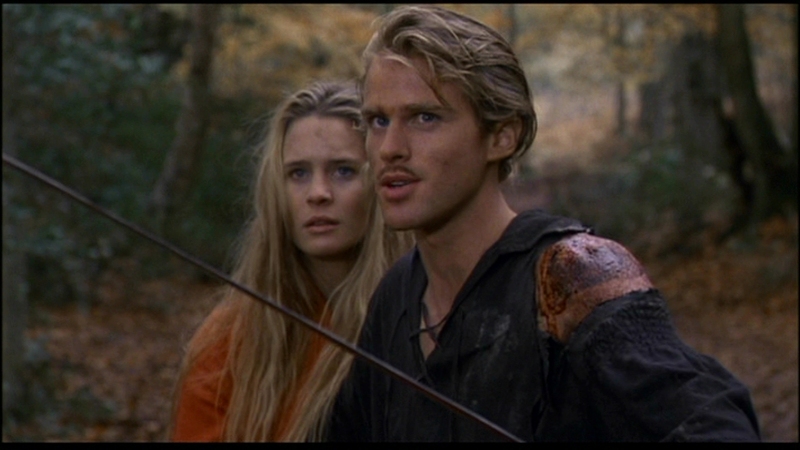 I will be bold enough to say, that no leading man within this genre has ever topped Cary Elwes as the ever faithful Westley when it comes to the romance department. His devotion to her is unquestioning. In a world where we feel honored if a man calls us rather than sends a text message, some modern ladies find it unfathomable for a man to treat her with such respect and devotion. Westley’s love was unwavering. Even when he was presumed dead, he believed she would wait for him. I mean really? Dreamy for sure… the eyes, the lips, the words he says? He fights giants and swordsmen, he climbs the Cliffs of Insanity to find her and reclaim their love. Because nothing is more honorable than True Love. Sort of makes you think it could really happen right? Buttercup: You can’t hurt me. Westley and I are joined by the bonds of love. And you cannot track that, not with a thousand bloodhounds, and you cannot break it, not with a thousand swords. Well as I stood on top of a mountain, and my guy looked at me and asked me to spend my life with him, I realized…. sometimes true love does win out. As a kid, I watched a lot of old television from the 70s. One of my favorites was Happy Days. A character was introduced on Happy Days that would become a part of popular culture from that day on. Mork, an extraterrestrial alien from the planet Ork. Mork was played by a young unknown comic, the incomparable Robin Williams. The popular character quickly became the star of a sci-fi comedy spin off, Mork and Mindy. Co-Starring Pam Dawber, the show centers around an alien living on Earth and learning how to get by in this new world. Only Robin Williams could have played an alien with such joy, wonder, and sincerity. In the clip below he explains what it’s like to lose a friend. Comedians tend to make some crazy movies in the beginning of their careers. The first comic book movie I ever saw was probably Popeye. This is definitely a kids movie, and I remember watching it every time it was on tv. To me, he just WAS Popeye. I don’t even think I considered it to be acting at that young age! Probably not the best movie ever made, but it was such a huge part of my childhood I never even thought about it as quality film making! Robin Williams went on to be a massive comic superstar and also an acclaimed and award winning dramatic actor over the years. His passing this week has rocked the entertainment industry as people struggle to wrap their heads around someone who brought so much joy to their lives could ever be unhappy. As the years past Robin Williams battled with his own demons when it came to alcohol, depression and substance abuse. I wont get into that, as I cannot begin to fathom what it was he went through, or pretend I understand how dark the night can get before the dawn for some people, creative or otherwise. What I will say, is that there are some entertainers who can connect to the public unlike any others. Whether through laughter or dramatic roles, some actors look at us through the screen and we just feel them. We feel their love, their pain, their sincerity, their earnestness. The prolific career that was Robin Williams brought about some performances that have shaped and formed us. Personally, Dead Poet’s Society and Good Will Hunting were the two performances that shaped who I was, and formed who I wanted to be as a person. I have always found encouragement and understanding of myself in film. These films, especially, remind you to seize the day, and live your life. Don’t just read about it, or learn about something, but truly feel every moment you are living. In a society so wrapped around technology it can be difficult for us to remember that. We forget sometimes to look up. To see the smile on another person’s face, to truly share an experience, or to reach out to someone who may just need a friendly smile to brighten their day. The articles I have read describe Robin Williams as someone who was always kind, generous, and went above and beyond to bring people the gift of hope and laughter. That is a trait that cannot ever be extinguished. Through the creative gifts he gave the world, Robin Williams will always be the first alien to walk among us, who taught us to laugh that much harder. Below are some clips that I have found to remind everyone how much joy and sentiment this man has brought to our lives. When a gifted comedian takes a dramatic turn in a role, the result is vulnerability which is unparalleled. The result creates magic that cuts right into you that is not contrived, that is not overacted, that is not cliche. What Robin Williams brought to dramatic roles was in fact, magic. I am continually shocked at how the passing of this genius has affected me to my core. It is as if I have lost a family member or a good friend, a life mentor. I guess I am not out of line in saying, my entire generation lost their favorite teacher. If you only watch one clip, watch this…. Rest In Peace, Mr. Keating. A new Los Angeles Tradition, accumulating an enormous following over the past several years is Cinespia. More commonly referred to around my group of friends as “the movies in the graveyard”. When telling people about this, I usually follow with the nomenclature, “its not as creepy as it sounds…” Cinespia is the brain child of John Wyatt, who uses the side of a huge mausoleum as his theater screen, adds dj’s before and after the film, and now has jumped on the photo booth trend, with themed photo booths per film. I have met John a few times, and he really enjoys finding films that are cult favorites that the people have earned a place in the hearts and culture of the people of Los Angeles. While the crowds of Cinespia can be difficult to maneuver, the addition of pre-purchased tickets has offered some help in that capacity. It also doesn’t hurt to buy an extra two bottles of wine at Trader Joe’s on your way in, to drink while waiting in line to get in! Get their early, bring lots of blankets, be PATIENT, and have some triple ginger snap cookies while you wait. For the fourth year running, Cinespia presents FROM DUSK TIL DAWN, the all night screening series, and this year, it is a fantasy film theme! Whats on the program? Holy Luck Dragons!!!! I don’t even know if the eight year old girl in me can handle this! I am sad to say, the event is already sold out, so I have decided to stage my own Fantasy Film Slumber Party complete with all three films on Blu Ray of course! I did not act fast enough, so I guess I’ll miss the graveyard adventure!!! 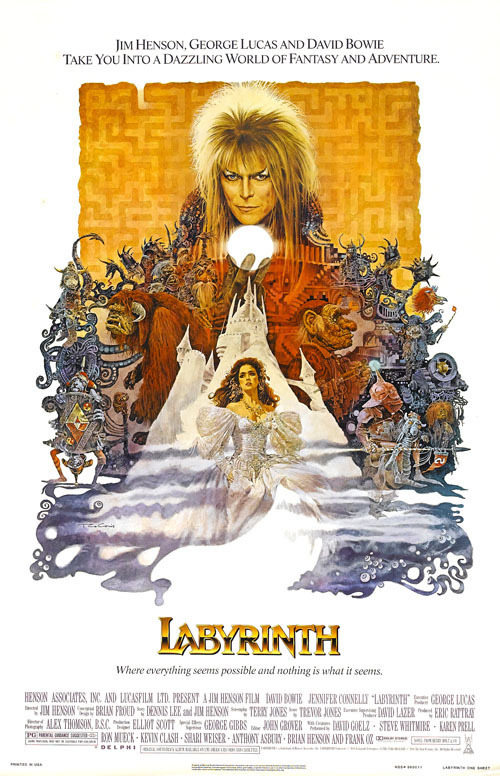 Of the three, Labyrinth has always been my favorite fantasy film. 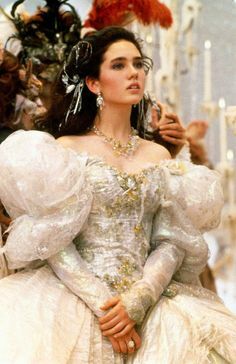 The combination of Jennifer Connelly’s ballgown and David Bowie’s singing was like an opiate to me when I was young. 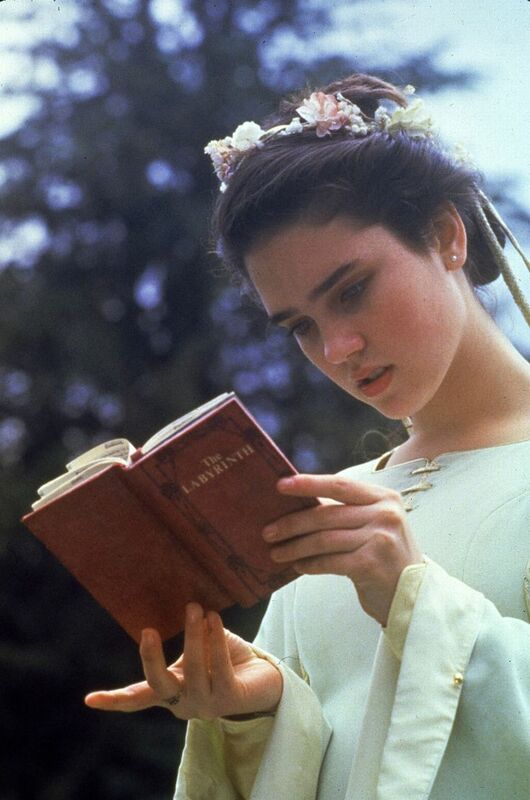 I could not get enough of this movie, but The Neverending Story was always a close second…. What these movies all have in common, is a sense of magic, beautiful fantastic sets and characters, elaborate costumes, and the inevitable fight of good vs. evil. I’m a sucker for a poofy white sparkly dress…..
More upcoming screenings at the cemetery? If you don’t live in the LA area, or you were too late buying tickets yourself, I advise you to hold your own Fantasy Film Slumber Party, complete with wine, snacks, and costume ideas from the films! 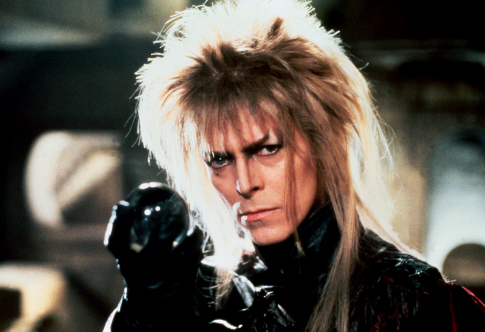 Or perhaps you can do your best David Bowie Hair impersonation…. Embrace it, wear something sparkly, put a flower wreath in your hair and be a little girl for a night! Channel your inner fantasy character! 1989. Video games were the primary fun to be had for kids under the age of 16, and I was 12 years old then… so that meant a lot of television, roller skating and of course Nintendo. Nintendo was everything. From Mario Bros. to Zelda these original Nintendo games were addictive 8bit masterpieces of beeps, boops, and electronic songs that never leave your mind. Around that time, Fred Savage was being the adorable Kevin Arnold on the TV show, The Wonder Years, winning hearts all over tween land with his on again / off again romance with “Girl Next Door” Winnie Cooper. Being the highly marketable star that he was, he was quickly chosen to play the everyday kid in cult classic, The Princess Bride, as well as leads in Little Monsters and a massive Nintendo advertisement disguised as a film, called The Wizard. Talk about product placement! 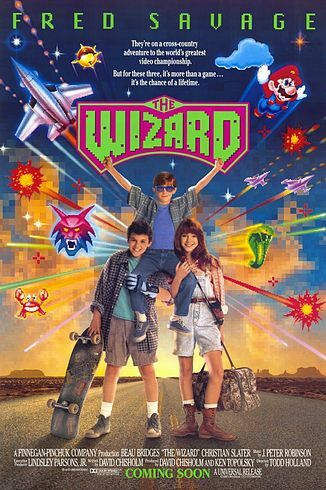 The entire premise of the film revolves around a boy (Savage) and his little brother hitchhiking across the country so his little brother can play in a Nintendo Championship Tournament. Along the way, they meet an adorable girl with red hair played by Jenny Lewis. Please note the powerglove Savage sports in the poster!!! Anyway, that little girl grew up to be just about one of the coolest ladies in music. Forming Rilo Kiley with fellow child actor Blake Sennett, she became a darling of the indie music scene when album. “More Adventurous” highlighted her vocals more so than previous Rilo Kiley studio recordings. Since then, she recorded a solo album under Conor Oberst’s label, Team Love, with the Watson Twins as accompaniment. Personally this album, “Rabbit Fur Coat” is a favorite. Over the years Lewis has launched additional solo albums, and provided guest vocals on a variety of projects, even touring with the Postal Service on their last tour. I was lucky enough to see that live and it was a highlight of my year to see them sing together. Her new album, The Voyager touches on topics once again relevant to my life.. I like that I have grown up with Jenny Lewis, and her films and music have sort of laid out a soundtrack to my own experiences and situations. She never shies away from writing lyrics that cut right to the internal struggle of women, and doesn’t make apologies or try to make it pretty all the time… sometimes life is hard, and I’m glad I can listen to these songs and see someone else has been through some of the same situations I have. I think Jenny Lewis is cool as hell, and if she can do it, so can all of us. Lewis has always seemed very approachable to me. She comes across as someone I would hang out with, drink a Jameson, and talk about old Nirvana recordings. I was lucky enough to meet her at a show at the Troubadour for the band The Like. She chatted with my friend and I and we decided we were going to bring back our favorite 90s fashion statement, Dr. Martens. …well Jenny…. We did it. Crafty-Nerd Picks of the Week! Lets highlight a few items found on my favorite cure for boredom… http://www.etsy.com!!! 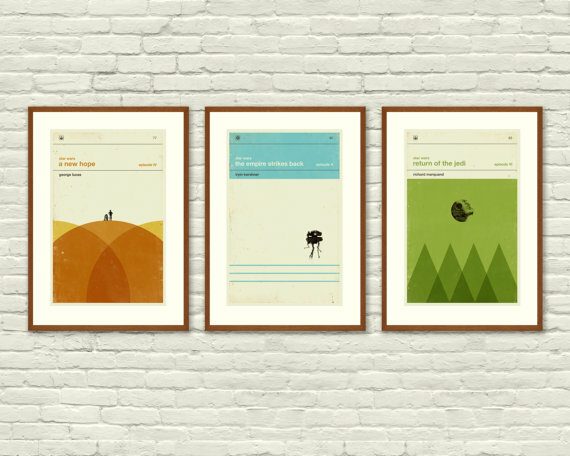 These Star Wars vintage book jacket style prints are currently hanging in my living room. They get a lot of attention from friends who come by, because the reference to Star wars is subtle. You have to look closely to see what is actually shown on the photo. These are just a great find! 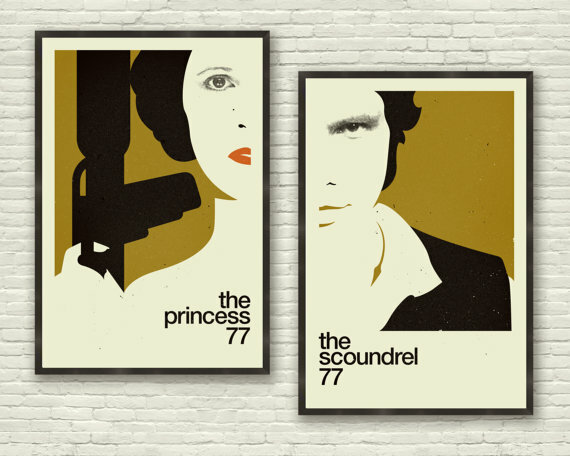 The perfect wall art for the nerdiest of couples! 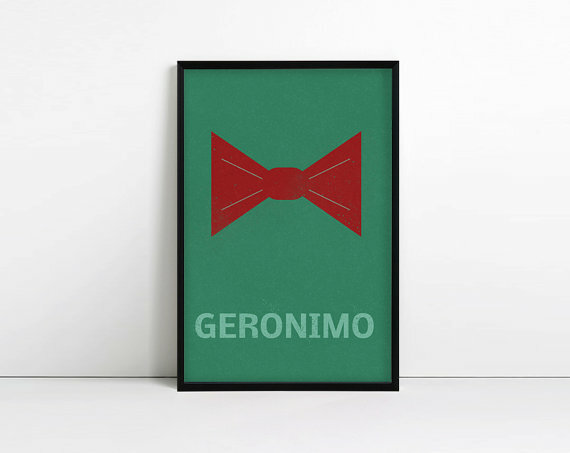 These fun Dr. Who art pieces are great because they are referential without being too exact. I love when you have to be a fan of the show to actually understand what the art refers too… That’s the nerd in me! Take a spin around Etsy, and make your home a reflection of you….. a FAN! This past weekend was Comic Con 2014, and as I pushed and shoved my way through the masses, I found my favorite booth….. Her Universe! The only way to describe my reaction to her booth, would be animated cartoon hearts shooting from eyes and exploding like fireworks upon all the adorable nerd fashion! What stands Ashley apart from other Female Fangirl Fashionistas is that her clothes are flattering! 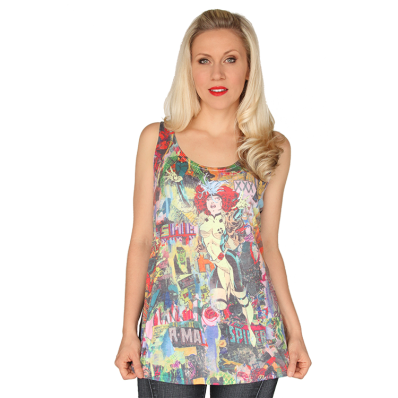 Ranging in sizes from XS to Plus Size, there seems to be something for just about every shape and size, and every FanGirl Genre. Star Wars (my favorite of course), Transformers, Avengers, Dr. Who, Star Trek etc…. 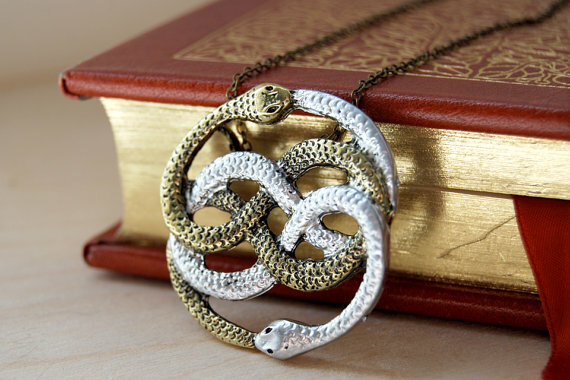 My purchase for the con? 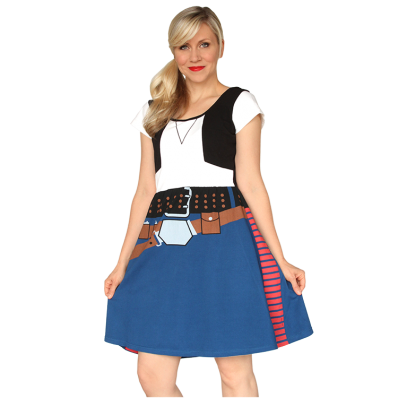 The Star Wars dress of my dreams!!! Designed with the pattern of the original bed sheets, this is really a look back into my childhood! What I love especially about this dress, is the wear-ability of it. This is not a costume dress, but an everyday dress that you can pair with a cute cardigan and heels! No need to wait for the next convention to pull it out of the closet! I will be wearing mine all over town! Her Universe has great costume dresses also! My favorite Star Wars picks? Some other items that caught my eye? I highly recommend checking out the website. When I was trying on my dress, Ashley herself took the time to tell me what a great fit she thought it was, and really stood out as someone who cares about her product, her company, and her clients. I feel she is giving us a product that we can really love and be proud to wear!